Details:She was born on 22-02-1898. As a patriot she fought the British to get freedom in her young age, Even Annal Gandhi praised her as one invoked independence feeling to her and remained as his ideal. She died on 22-02-1914. As a mark of respect her memorial was opened on 13-08-1971. Her statue, life history and photographs displayed here to visit public at the area of 2451.65sqm. The Library also functioning regularly in this memorial. Situated in Thillayadi Valliammai Village at Tharangambadi Taulk. India Security Press Nasik designed the stamps. 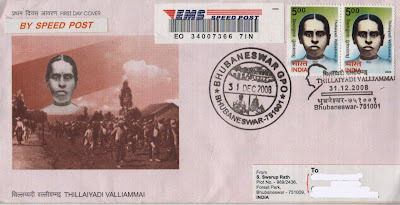 Remark:Nice real posted FDC by my friend from India by registered post.Thanks to India post for making availability of the materials. 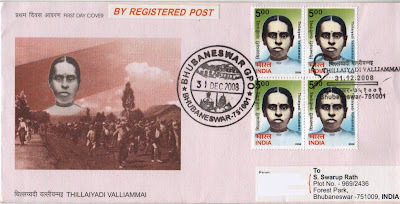 Can someone write here how to get few stamps of this great freedom fighter Thillaiyadi Valliammai, is it available online?. Or Where can I buy them, will it be available in all Post office or certain P.O?. Does anyone know if there are any living members of Valliamma's family as I am a writing a piece of history on her life.